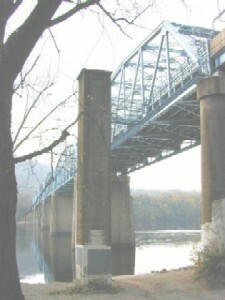 USGS stream gage on the Potomac River at Point of Rocks, Maryland. CO-OP conducts annual drought exercises with stakeholders to ensure a cohesive, coordinated response in the event of a low flow on the Potomac River. CO-OP begins daily monitoring when flow at the U.S. Geological Survey (USGS) stream gage at Point of Rocks, Maryland, falls below 2,000 cubic feet per second. During drought monitoring, CO-OP sends out daily email reports to stakeholders summarizing flow, weather, and demand conditions. These monitoring updates are made available each morning. Potomac River at Little Falls dam near Washington, D.C. 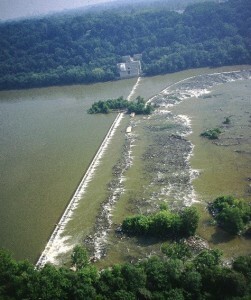 CO-OP begins drought operations when flow in the Potomac River at the U.S. Geological Survey gage at Little Falls dam drops below the total metropolitan area supplier daily withdrawals plus the 100 million gallons per day flow-by, or when CO-OP flow forecasts indicate that there is a significant chance that releases from Jennings Randolph and/or Little Seneca reservoirs will be needed within the next ten days. During drought operations, CO-OP sends out reports to stakeholders twice daily. Reports summarize basin flow conditions and system demands and reservoir storage volumes and contain recommended withdrawal targets and reservoir release rates. These reports are also made available to the public.